The doctor was in, and even though Beth has been feeling pretty bad, he said, “the worst is over”. The doctor just told us that technically, today is Beth’s first day of engraftment. Her white cell count was 2.0, so she’s no longer neutropenic — can eat anything she wants, there is no need for us to maintain a sterile environment at home, etc. She can fight the fevers on her own. She’s feeling quite a bit of bone pain, still some minor fevers and headaches, but as the doctor said, “the worst is over”. The nurse here, too, said that one thing they don’t say enough about is that this second week past the transplant is the worst. But she has no signs of GVH at the moment — liver, GI tract, and skin are at an acute risk at the moment, but no signs of it. I guess there are still opportunities for complications, but the worst is past. The most annoying thing is the mucositis — the mouth ulcers. They’re affecting her ability to eat, giving her pretty decent heartburn. She’s definitely been through the wringer. I just got back to the hospital. Beth had only one mild fever this afternoon. Her white blood cell count was .10 yesterday and .29 today (for normal folks it’s over 5.5). But the increase in white cells is the first sign that engraftment is taking place. And it means she has her own ability to fight off infections. So much so that they discontinued one antibiotic, the vancomycin. It’s about 6:00 now; I’m going to head back to the hospital to spend the night with Beth (I went in to work four hours today, and got a few things done). Beth is going to get her first dose (of three) of Thymoglobulin, which, I understand, suppresses the immune system. She’ll also get the last doses of Fludabarbine and Busulfan. They’ve given her some “pre-medications”, which had her sleeping all day. We’ll see how she handles all this tonight. For the next two days, then (the 13th and 14th), she’ll get the Thymoglobulin and the total body radiation, and the donor’s stem cells should arrive here the evening of the 14th. By that time, our hope and expectation is that the leukemia-producing bone marrow will be completely destroyed. Of course, then we have about a year dealing with issues such as engraftment, infections, and graft-vs-host symptoms, but the end of the leukemia is near. Now that a donor has been recruited, Dr. Rossetti thinks that we will be able to “have stem cells by mid December”. No dates are firm yet, but we should be able to have a firm schedule in place by the end of next week. Beth’s blood counts continue to be critically low – her white blood cells yesterday fell below 1.0 (“.94”) for the first time since I’ve been watching the numbers. 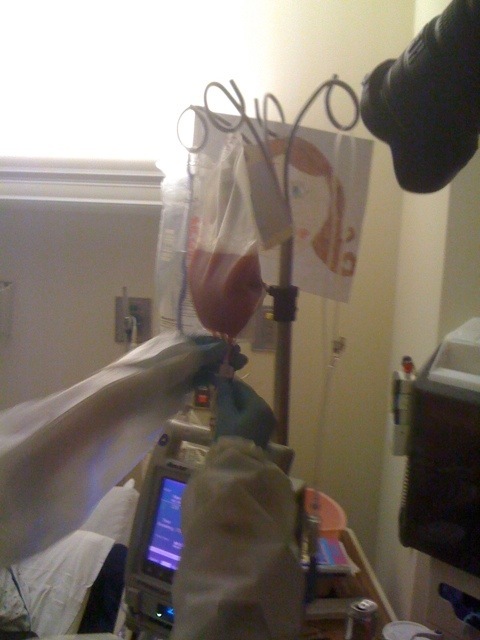 And as I noted, her hemoglobin was 7.2, and her platelets were only 18 (again, lowest I’ve seen them). So today, Tuesday, she’ll go to Jefferson Hospital for her (7th of 7) injections of Vidaza, for two or more units of blood, and also, for platelets. Beth’s bone marrow is defective, and every stem cell she produces is defective, and so the goal over the next few weeks (including the “intensive chemotherapy” and radiation) will be to bring her “as close to zero bone marrow” as she can get. The Vidaza, while not enabling her to produce good blood cells as promised, has at least gotten her most of the way there already. And that’s a good thing. [Also a “God” thing, as I had written at first.] The reason you want all of it gone is to reduce the chances of relapse down the road. And in addition to the “intensive chemotherapy”, the full body irradiation “cuts relapse rates 20%”, according to Dr. Rossetti. Every little bit helps. Once the new stem cells are transplanted, then Beth’s numbers should begin to go in the right direction. Her white cells should begin to recover within 2-3 weeks. Engraftment should occur on or before day 30. Hemoglobin production should start in about three months. Anti-rejection drugs will be administered between days 35 and 90 – more or less to either to control or enable some “graft-vs-host” (GVH) effect. To some degree, the GVH has a “mopping up” effect – the immunity of the new stem cells will target and destroy any remaining defective bone marrow, or any remaining defective stem cells. Too much, to be sure, can cause problems. But this is what the donor search has been all about: matching on precisely the right DNA characteristics, to give just enough, but not too much, GVH.